Hi, Traditional Cooking School readers! I’m Lauren, a 19-year old real food fanatic, and I blog at Empowered Sustenance. I’m excited for this opportunity to tell you a bit about my healing journey and share a GAPS recipe with you! 5 years ago, as a freshman in high school, I was diagnosed with ulcerative colitis. For a while, I held my colitis under control by obliviously popping prescriptions to suppress any symptoms. Unfortunately, my colitis advanced aggressively while prescriptions muted my body’s attempts at communicating with me. “You are probably looking at a colon resection in the future,” my doctor solemnly told me. Horrified tears streamed down my face as I promised myself that I would never lose my colon. Last fall, with that vow, I left for college — armed with potent immune-suppressing medication and a plan to eat and sleep well in the dorm. During that first semester at college, my colitis flared constantly. I struggled to mask my health issues, but I could no longer hide my dwindling energy or humiliating hair loss caused by my medication and distressed intestines. At the end of the fall semester, I signed up for online college courses, headed back home, and ditched my medication. I threw myself wholeheartedly into treating my colitis with nutrition. I started the Specific Carbohydrate Diet (SCD) after researching its track record for colitis treatment. After only 2 weeks, my flare stopped and I felt energy seeping into my muscles. With additional research, I realized that I was basically following the GAPS Diet, since I was incorporating fermented foods, healing fats, homemade broth, and detox baths into my healing regimen. Following the SCD/GAPS Diet is the most effective, important step I have made on my healing journey. Since starting GAPS, I spend exponentially more time in the kitchen. The concept of “convenience foods” radically changes once on the GAPS diet. Now I interpret this term as something that I've already cooked and is available in my fridge! And yet, since I can't do everything, I also visit Whole Foods for Bubbie’s naturally fermented pickles and sauerkraut, as well as raw milk cheeses. I love Trader Joe’s commitment to purity and great prices in their store brand products. With a few smart moves and prudent planning, I stock my fridge with these “convenience foods” each week for an easy meal or snack. The secret to reducing GAPS food prep time? Cook in bulk and find hands-free recipes. Grain-free meatballs fit this bill perfectly, for example. I make a couple pounds at a time and cook them in the oven, instead of tediously tending to them on the stove top. My GAPS Slow Cooker Apple Pie Filling also uses these time-saving shortcuts. Not only does this apple pie filling provide the soul-warming taste and fragrance of apple pie… but it does this without the effort of making a crust! Additionally, the slow cooker produces tender, juicy apples without heating up the house like the oven. Unfortunately, typical slow cooker apple pie filling recipes call for starch (such as cornstarch) and sugar. Here, I’ve subbed honey for the sugar and added the step of reducing the cooking liquid. This perfectly replicates the thick, velvety filling from a “normal” recipe. And now, let's get to it! Toss together the apples, honey, lemon juice, and cinnamon in a slow cooker. Dot with the butter or coconut oil. Cover and cook on High for 2 1/2 to 3 hours, until the apples are tender. With a slotted spoon, remove the apples from the cooking liquid. Carefully transfer the cooking liquid to a saucepan. Reduce the cooking liquid by simmering it over medium heat; it will take just a few minutes. The cooking liquid should reduce in volume by about 2/3 and should resemble syrup. If desired, stir in another tablespoon of cold butter, ghee or coconut oil for a richer dessert. Pour the reduced liquid over the apples. Top with Crumble Topping or coconut milk, if desired. I also love this with a chunk of raw milk cheddar cheese. For more great GAPS friendly recipes, head over to Empowered Sustenance. Eat well and heal! Wardee: I bet this would be delicious with pears, too! Be sure to welcome Lauren in the comments and let us know what you think of this recipe when you try it. New to our GAPS series? 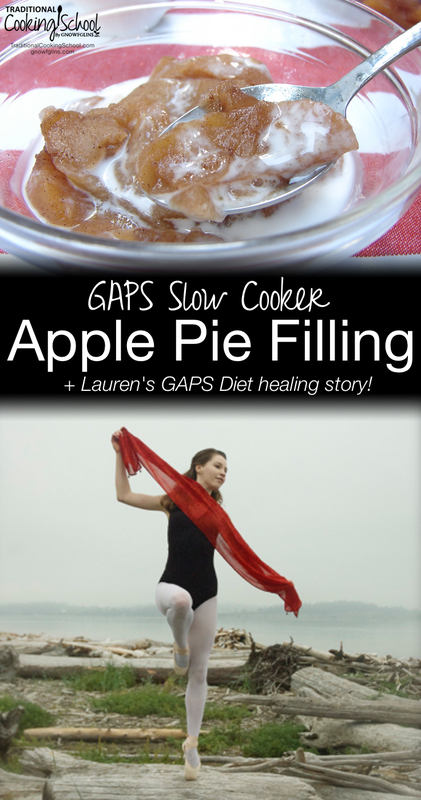 Get up to speed by browsing past posts in this series or reading what the GAPS Diet is. This post was featured in 57 Scrumptious Egg-Free Desserts. Hey Caroline! I hope your family enjoys this apple pie filling. I am sure whatever you create for a grain free crust will be delicious. We’ll all be waiting for you to share it with us on Gutsy! And happy birthday to your Dad! empoweredsustenance.com contains content from westonaprice.org, a site known to distribute malware. Your computer might catch a virus if you visit this site. We have already notified westonaprice.org that we found malware on the site. For more about the problems found on westonaprice.org, visit the Google Safe Browsing diagnostic page. Same info when I tried to go to site as well. I’ll let Lauren know. I just scanned Lauren’s site through sucuri.net and it came up clean. But, the WAPF site did not come up clean. Oh dear! I don’t know what to do about that. Should I temporarily remove all my links to Westonaprice.org? I don’t want to scare people away from my site! I’m thinking this would be SO good with the vanilla coconut milk ice cream on thenourishinggourmet. Gonna have to put that on the menu! This is a God send thank you! I love love love apple pie and crisp and now I feel I have something to make for myself when I make my men theirs. All your post on GAPS has been very helpful, thank you so much. I’m glad you enjoy this recipe, Mary! I know how hard it is to feel left out when your family is eating non-GAPS things. I am sure your family members will enjoy this apple pie filling just as much as a conventional, white-sugar filled version! This looks fabulous- but I don’t have a slow cooker- could the recipe be used on a conventional stove top- if so- any suggestions? This recipe also works in the oven, but I don’t think it would on the stovetop. Just slice the apples and toss with the honey and cinnamon. Put it in a casserole dish and dot with butter. I can’t remember how long it took the apples to bake in the oven–I think I cooked mine at 350 for maybe a hour. Just bake until the apples are soft, and give them a stir every 30 minutes or so. I don’t think you will have to reduce the juices after cooking, because the oven allows the steam to evaporate. I hope this works for you! Patricia, I’ve cooked apples on top of the stove in a heavy metal pot with a lid on a very low flame. However, I needed to pay attention to it, and make sure it didn’t burn–lots of stirring. Instead of honey, I used apple juice, and cooked it down until I got a thick and sweet apple butter. Can use as a pie filling or on toast–yum, yum. Sounds yummy. Congrats on healing yourself. I don’t need to be gluten free or on GAPS, but I still might make this! It looks delicious! You are so right! This is a great recipe for those who just want a non-processed, healthy treat. The rest of my family doesn’t eat a special diet, and they really enjoyed this! I made this today and it was wonderful! The only thing – I didn’t have any “liquid” to reduce. I also poured a couple of Tbsp of raw cream over the top! YYYYUUUUMMMMMM!! I’m so glad you enjoyed this, Morgan! The liquid amount will vary, depending on the kind of apples and your slow cooker. I’m glad you could skip that step–it makes the recipe all the more simple! Mmmm… the raw cream topping sounds divine! I am now looking for a slow cooker. I would love some input as to what brand and model you have been happy with. Also, I have heard there is measurable lead in all slow cookers. Does anyone know which ones have the lowest lead content? Are there any other kinds of kitchen devices simular to a slow cooker without the issues of lead that will perform the same tasks or are perhaps even more versitle? I want to be able to make bone stocks and cook meals and do not need all the bells and whistles, but do want something where I can control the temps so it is not too hot on low. I am willing to spend decent money to get a good rock solid device. Any advice would be very appreciated. Thanks! I wish someone would comment here regarding Carol G.’s concern about lead leaching from crock pots into food, and what crock pots y’all use. Thanks! I definitely plan on trying out this recipe. My office is planning a Southern-Style potuck and I wanted to being something as healthy as possible. I hope it’s a hit!